As the lazy days of summer wind down and we make way for fall festivities, we savour these moments and want to make delicious memories the best way we know possible, with our taste buds. Watermelon often comes to mind when we think of outdoor grilling, picnics and days spent at the beach. This versatile fruit can be enjoyed in so many ways and we love seeking out tasty ways to enjoy this mouth watering fruit. Here are some of our favorites across the US of A.
Pickled watermelon is as big in Louisville as the Louisville Slugger Museum & Factory. We recently caught up with Chef Darmaris Philips, whom you may recognize from this season’s Next Food Network Star, as she was kind enough to share her recipe for pickled watermelon rind. Wanna look like a Food Network Star for your guests? Make this at your next gathering and watch everyone ask for your autograph. In a large bowl mix salt and watermelon rinds and let sit overnight in refrigerator. Thoroughly rinse rinds. Transfer to a large saucepan, cover with fresh water and over medium-high heat, cook 10 mins until rinds are tender. Drain and set aside. Return the saucepan to heat and add vinegar, honey and spices. Bring to a boil, then reduce heat to low and simmer for 10 minutes. Add watermelon rinds and cook until transparent, about another 10 minutes, stirring occasionally. Sterilize jars and lids directly before using for 10 minutes in simmering water. Jars should be warm when you fill them. 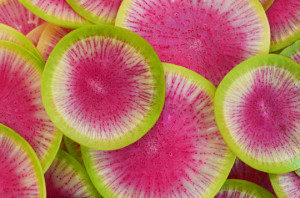 While rinds are still hot, fill jars evenly with rinds and liquid to within 1/4 inch of the top. Tap the jars on the counter to get rid of any air bubbles trapped within. Wipe rims with a clean damp cloth and seal jars with lids and rings. Process in a boiling water bath (making sure water level is 1 inch over the top of the jars) for 10 minutes. Remove from water bath and allow to cool on the counter overnight. As classic cocktails are making a comeback, mixologists around the globe are recreating classics and using fresh, locally sourced ingredients. 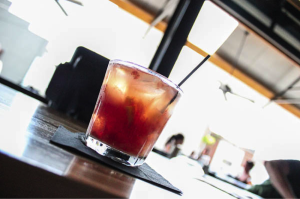 We are ready to hop on a plane to Chattanooga for the incredible Watermelon Old Fashioned that we found at the Flying Squirrel Bar. Why not impress your friends and family and recreate this watermelon treat? Recreate this classic cocktail with a twist! Inside you find: Chattanooga Whiskey, watermelon, orange, sugar cube, old time bitters and a splash of soda , we love how they used sweet, succulent watermelon for a new twist on an old classic. Many of us leave our hearts, and palates, in the gorgeous city by the bay. Known as one of America’s most popular culinary destinations, craft beers from San Francisco are creating a huge following with fans across the country. One of our favorite breweries, 21st Amendment, has an incredible brew that we can’t stop thinking about. 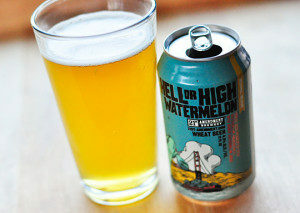 Their Hell or High Watermelon is a wheat beer that with is brewed with real watermelon, for a flavor that’s surprisingly crisp, dry and refreshing, it is truly summer in a can. Available April through September, this beer will be the highlight of your summer party.